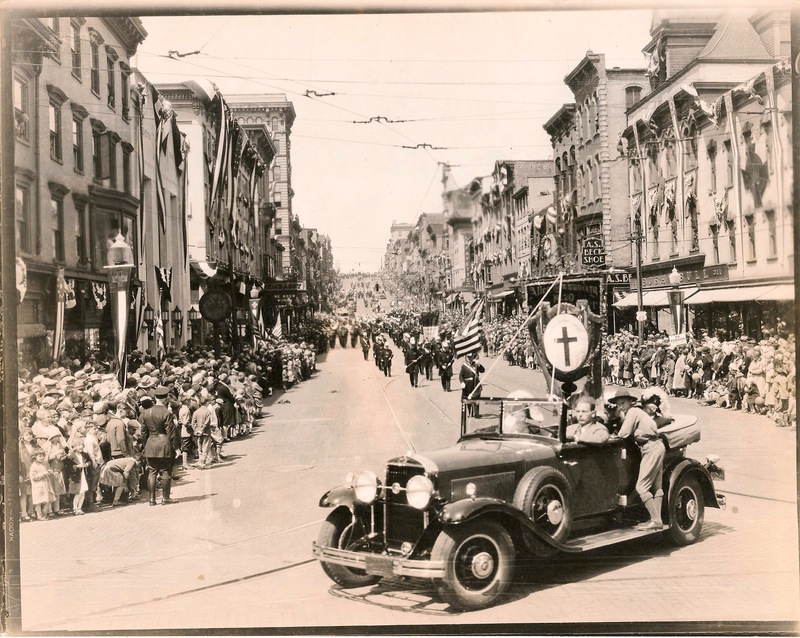 A small format panoramic gelatin silver print, view down a street of a parade of Knights Templar in full dress uniform, preceded by honor guard carrying flags. They are marching past homes and what appears to be a two story storefront. Right end of photo is strangely fried, perhaps improperly fixed. Verso has the number 79 stamped on it, LR. From a lot of 19 photographs purchased on eBay. 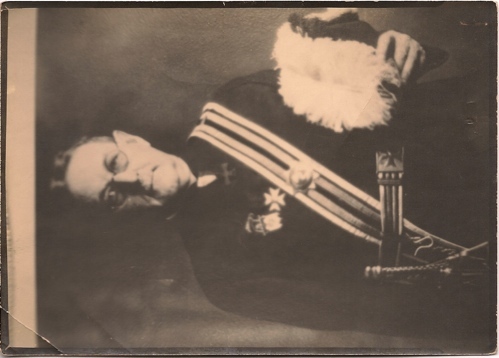 Pictures of Masons, OES, Shrine and Knights Templar in Montana, along with one picture from Indiana and another from North Dakota. A small format panoramic gelatin silver print, a group of men in suits, all wearing medals or ribbons on their own left breast, posed before a wooden cabin in a woods, with a stone fireplace. 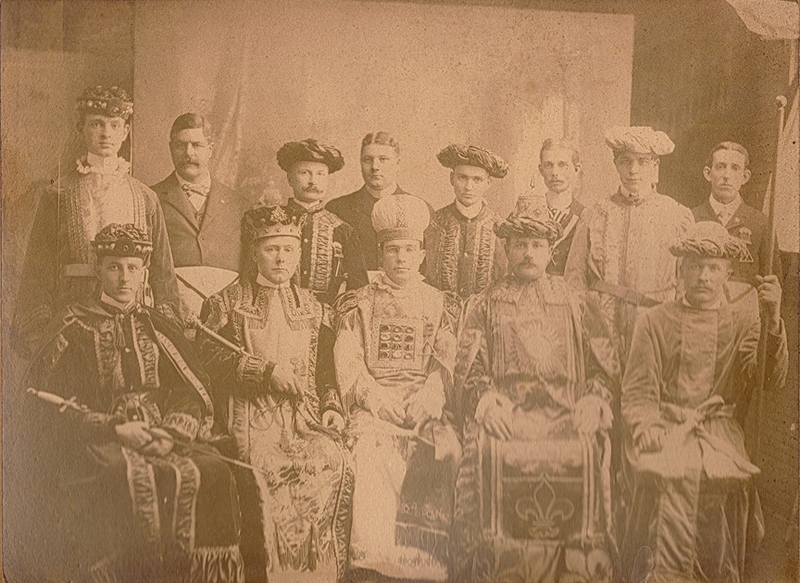 Albumen portrait of thirteen men, most of them in extensive costume or regalia. This seems to be the officers or ritual staff of a Royal Arch Chapter, based on my comparison of their costuming to the figures seen in a Royal Arch certificate. In background are four men who are not in costume, but two of them can be seen to be wearing Masonic aprons. Across the front row, the characters can be identified as: Captain of Host (? ), King, High Priest, Scribe, Principal Sojourner. Back row: Royal Arch Captain (? ), and the rest are indeterminate or uncostumed. No definite mention of the meaning of the stars, but probably indicate that the Brother was deceased at the time of the listing. Standing portrait of a man wearing a dark military jacket, striped sash, belt with the Cross of Malta, and several military-style medals and a sword, and holding a hat plumed with ostrich feathers. Possibly a contact print, onto a strange paper with high silver content and rather glassy verso surface, perhaps from a glass negative. Tape around the edge of the negative seems apparent (though this would normally should resulted in a white band around, rather than a black band?). 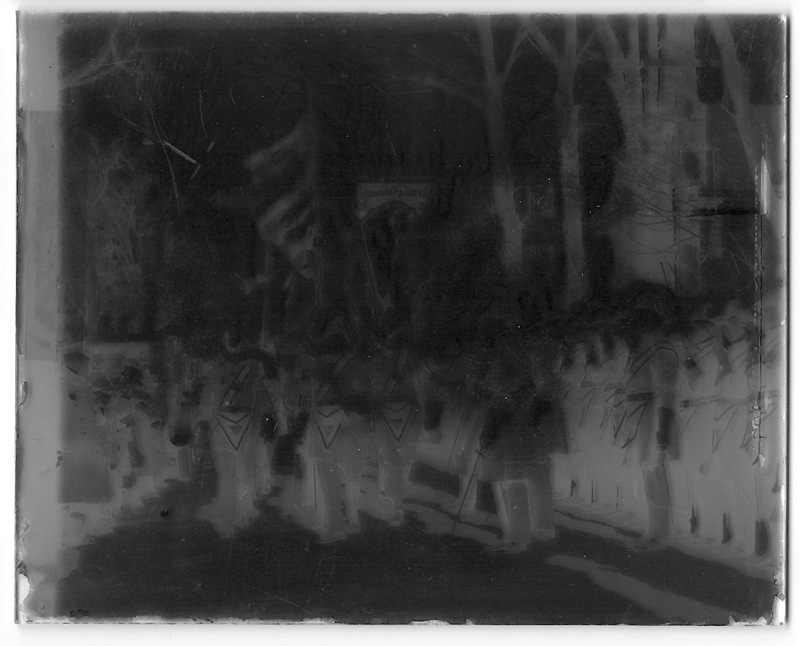 Albumen contact print, possibly from a glass negative, based on shadows at margins. 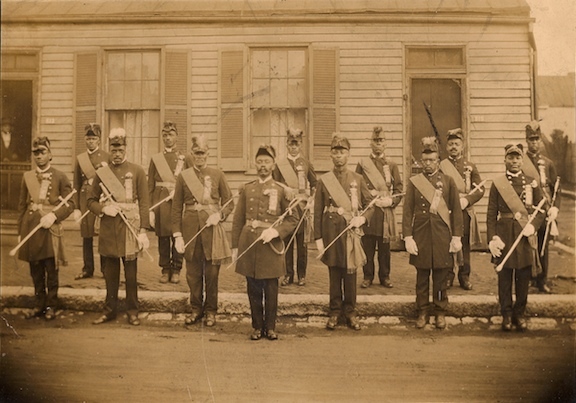 Thirteen African American men in fancy dress uniforms, including long jackets, chapeau hats, swords, sashes. A fourteenth person looks on from behind a screen door, left margin. Each of the uniformed men wears a ribbon his his left breast, possibly with an emblem of office on each, and each has a light-colored carnation flower stuffed behind the ribbon. Was sold to me as, and may reasonably be assumed to be, Prince Hall Knights Templar, although could also be potentially GUOOF Patriarchs Militant. This could be researched, based on dates and costume. Most probably PHA KTs. I date this photo c.1880, so 15 or 20 years after the end of the Civil War. Fraternal organization amongst African Americans in North America dates to the Revolutionary period. And even in erstwhile slave states, including amongst enslaved men and women, fraternal organizations were active before the Emancipation. This is a gem of my collection, for its date, its rarity, and for its reification of fraternal activity amongst recently freed African American communities in a former slave state. View down a dirt “main street” of a town, buildings draped in bunting. A flag of the United States hangs in foreground. Flag has 45 stars, which strongly dates this photo between 1896 -1908. A parade of men in paramilitary style fraternal regalia stretches from foreground into distance. They appear to be Knights Templar, but any truly distinguishing features that might definitively ID them as such is too small or indistinct to read. Could be IOOF PMs or KofP UR, etc. 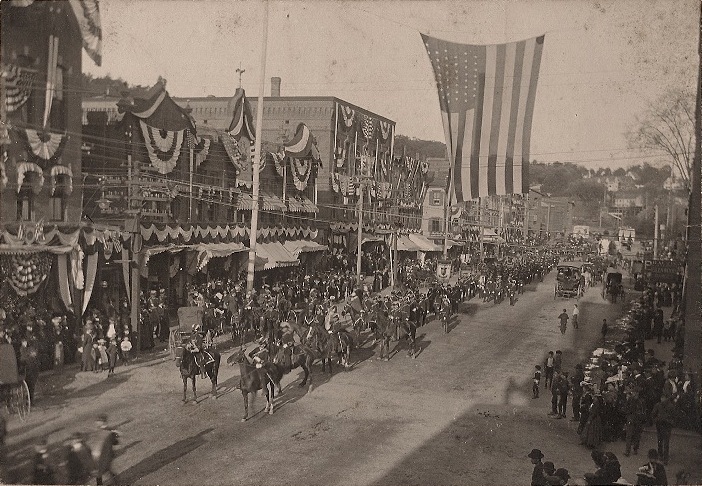 Several of the men ride horses, but most are on foot, and there are several banners being carried, further back in the parade. Significant numbers of onlookers are in attendance, and there are horse-drawn carriages visible on the street throughout image. Mount measures 7”x9” and has a decorative border around photo. Verso, a burned image transfer from another photo of a river boat. In blue ink is written in cursive “MEL”, probably initials. View from an intersection down a street in Easton, Pennsylvania. A car is turning, just in front of the camera, with a guidon or banner upright from the back seat, which reads, “Allen Commandery No.20” with an upright latin cross on an oval plaque. Men in KT chapeaus are riding in passenger and back seat, and a boy in a scouts uniform (?) stands on the running boards, and looks over his shoulder to the camera. Down the street can be seen approaching formations of Knights Templar, led by an American flag, with a black and white banner behind. A marching band can be seen in the distance. Street laps are hung with long banners, with a cross emblem at the top and striped material below. Buildings are festooned with bunting and hung with flags. The sidewalks are crammed with onlookers. Knights Templar in parade uniform standing in formation, while a formation marches past. Those marching past are led by officers in triangular aprons emblazoned with the Patriarchal Cross within a triangular field, followed by a color guard carrying an American flag and the beauceant of DeMolay Commandery. On the opposite side of the street, a crowd looks on. Gelatin silver print. 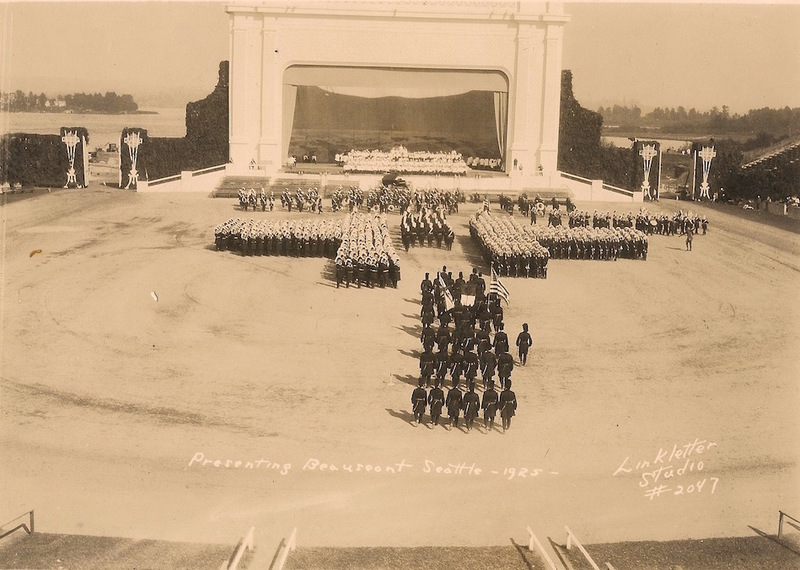 View from some height in a grandstand of the stage of an outdoor theater or auditorium. Large massed formations of Knights Templar. A group marching six wide and about ten deep, with a Union Jack, American flag, and Beauseant approach to pass between two large ranks of Knights arrayed in Tau-like formations. Beyond them, at the foot of an enormous white proscenium, is a marching band. A huge backdrop stretches across the stage. On either side are tall walls that appear to be covered in ivy, and gates through them are flanked by white designs. View in the distance appears to be of water, perhaps the sound. There are no crowds or onlookers visible.